There’s enough on the board for either of you to take interest. It helps drive strategy, but still track tactical stuff; stuff that’s important for the individual’s growth, and the manager’s. You can always go through the ReadMe card (under the Discussion list) to know how it works, but here is a quick summary. There are 5 lists, each with a few cards. 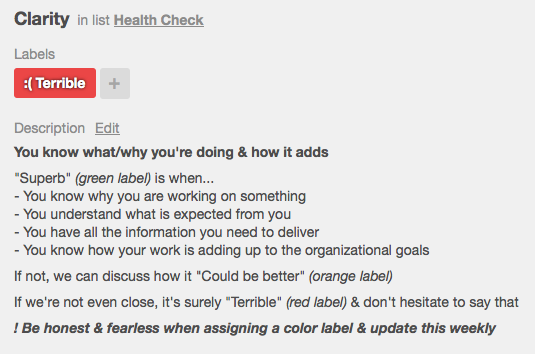 Few need to be updated weekly, some just need color coding, and most others are to be updated twice a year or so. There is always going to be some discontent in the team, about something: pressure, control, compensation, or the shear nature or volume of work itself. Unless you share great rapport, a team member would rarely come up to tell you that they’re feeling lost or unhappy about something. This mental stress shows elsewhere in the individual’s work, and its best for you to know it in time. I wanted to make it easy for my team to hint me about their feelings. It took a while to figure out the right indicators and how to get answers. I ensured that each one had a clear definition of the ideal situation – typical of a Product Manager writing acceptance criteria. How can a card go without Acceptance Criteria? As a manager, this is the most important list for me. This list has 6 indicator cards to help me know how each team member feels about clarity, authority, opportunity, balance, support & recognition in their current position. Each card has a criteria that defines the ideal or “Superb” situation. Team members are expected to apply one of three labels to each card to indicate Superb, Could be better and Terrible, by updating it frequently. Its my job is to encourage them to be honest about this. My interest here was not to track work. My idea was to let individuals have a view of where they spend time; particularly, the spread between planned & unplanned work. As Product Owners, it is difficult to control ad-hoc, Q1 stuff, but at least it commits us to a few quiet hours every day to work on Q2 tasks. Every week has its own card, with checklists to note planned, unplanned tasks, along with action items from the 1-1. This list is a snapshot of the team member’s long & short term goals, along with a growth plan to get there. It took time to conduct each individual’s SWOT analysis, but they appreciated. In fact, it helped draw out a development plan for each one. A card summarizes their key achievements – for reference during reviews, and another one to know them better. It is important that managers invest time in these cards, as they would act as beacons for the individual’s growth. So they could learn & do it with their future teams, I encouraged the team to SWOT me. Having said that, its been a bit difficult to get them to do this. I added this for all the miscellaneous discussion that needs to be captured. If you share common interests, this could be a place to share links & thoughts. Very optional! With this board, we have a single version of truth: of the plan I have for the team, what I expect out of them, and in return, what they think & how they feel about their work & me. With a growing team & frequent time, it gives me more time to focus on the team members, as against discuss their work which I can follow from anywhere. Its easy for the team to give me a shout just by tagging me. This is in no way a replacement for face-time! Even if you’re remote, you should connect with your team via video chat. This is only a tool that facilitates conducting 1-1s & tracking action items. It goes beyond 1-1s in laying out the growth plan for the team. Make sure you Change the visibility to make the board private. You can then click ‘Add member’ under the sidebar to give access to that team member. You can always get some inspiration from the sample board showing real-world use. The board is fairly elaborate and it might take a bit of push to get it adopted across the team. The first step as a manager, is for you to invest time on cards in the individual’s list: prepare a SWOT, understand their goals, formulate a plan and help them achieve. This is the most important part of the board from from the team member’s point of view, and investing in it is going to keep them invested. So, do it well! It might take a few initial pushes, but it’ll be worthwhile. Well that’s totally up to you. 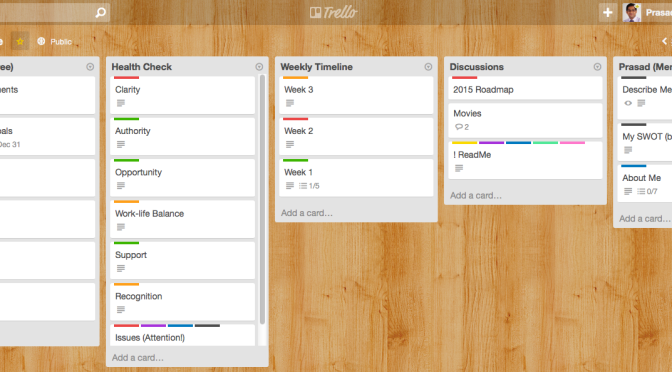 You can replicate this board as a spreadsheet, or do this using Post-Its. Trello wasn’t purpose-built for this, although it works just fine. 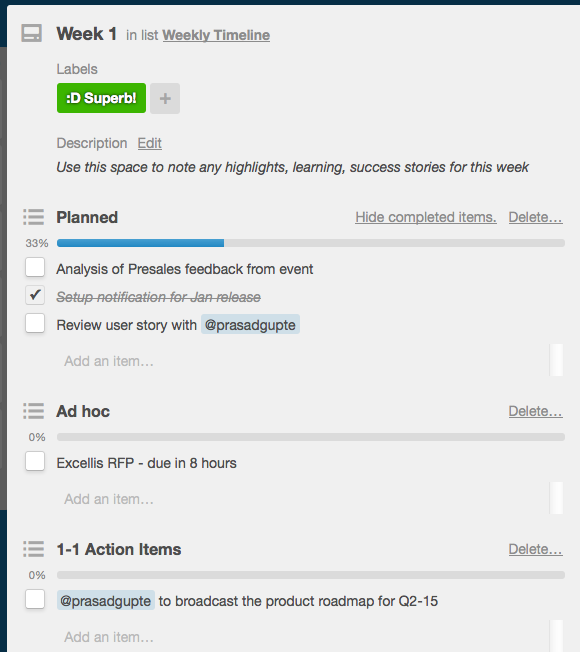 The advantage with Trello is that you can tag folks, which in turn notifies them. You can subscribe to cards, share them, or even update via email. It also has a mobile app that allows anywhere access. As long as you can keep it transparent & interesting, whatever floats your boat. Good luck with your team! And let me know how this works for you. This work is dedicated to Amit Sharma & Lata Gwalani, both of whom have provided colossal inspiration in coaching & leading teams. I’d like to thank my team of Product Owners for participating in the beta & actively continuing to use it.